Analysis: Walford played all of two offensive snaps with the Jets last season, both of which came during a Week 17 contest against the Patriots. He'll spend the offseason working to distinguish himself in a crowded Miami tight-end room that already includes Mike Gesicki, Nick O'Leary, Dwayne Allen and Durham Smythe. 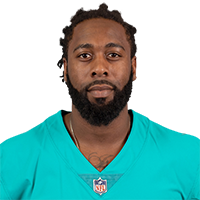 Analysis: Walford previously spent time with the Jets this offseason, when he led the team with seven receptions and 92 yards through all four preseason games. The fourth-year pro was waived by the Colts on Dec. 7 after having spent nine days with the team, and he now rejoins New York's squad as a depth piece behind Chris Herndon and Jordan Leggett. Analysis: Walford was waived to make room for rookie wideout Daurice Fountain on the 53-man roster. The fourth-year tight end was signed by the Colts as a free agent Nov. 28, but he was not active for a single game with the team. Walford will now be subjected to league waivers and will be free to search for a depth role if he goes unclaimed. Analysis: The 2015 third-round pick resurfaces in Indianapolis after failing to make the Jets' 53-man roster out of training camp. The Colts just lost Jack Doyle to a season-ending kidney injury, and each of their other four tight ends shows up on the Week 13 injury report. Regardless, it's difficult to imagine a scenario in which Walford becomes a significant part of the Colts' passing game. Analysis: While Walford hasn't exactly turned heads, he's provided a steady presence at the tight end position. He led all Jets tight ends in receiving yards Thursday and was third on the team overall. Jordan Leggett and Chris Herndon were viewed as New York's two most exciting tight end options, but neither has a catch yet this preseason. Walford opened the preseason by hauling in both of his targets for 27 yards in Friday's 17-0 win over Atlanta. Analysis: Walford didn't get many chances to shine, but he was effective when called upon. The former Raider remains in the mix in New York's wide open tight end competition, though his plausible range of outcomes includes everything from a major role to not making the roster at all. Darryl Slater of NJ.com views Walford as a candidate to be omitted from the Jets' final 53-man roster this fall. Analysis: Plenty can happen between now and cut-downs, but Walford isn't guaranteed anything with the Jets despite the void at tight end created by the departure of Austin Seferian-Jenkins. Jordan Leggett (knee) and Chris Herndon (knee) are currently the co-favorites to to land the starting job. Walford could be in jeopardy of losing his job, Andy Vasquez of northjersey.com reports. Analysis: Walford has a slight edge over recent draftee Chris Herndon and Eric Tomlinson for the starting tight end spot in New York. Jordan Leggett could also rise in the ranks should he impress during training camp, but for the time being it looks like this could be a three-man race. Walford's experience could be a key factor during the evaluation process, but Herndon seems likely to put up a good fight, especially if the Jets place a large emphasis of their evaluation on receiving skills. The Jets claimed Walford off waivers Monday, Field Yates of ESPN reports. The Raiders are releasing Walford (concussion, neck), Adam Schefter of ESPN reports. Analysis: A 2015 third-round pick, Walford caught 61 of 103 targets for 688 yards and six scores over his first two seasons, but then had just nine receptions in 13 games last year before landing on injured reserve due to a concussion. The transaction suggests he passed a physical, and he should find an opportunity to compete for a backup job elsewhere. Jared Cook is locked in as the top tight end in Oakland. Walford (concussion, neck) was placed on injured reserve by the Raiders on Saturday, Michael Gehlken of the Las Vegas Review-Journal reports. Analysis: Walford had yet to practice since sustaining the concussion in Week 14, so this move isn't overly surprising as the regular season draws to a close. Pharaoh Brown has joined the 53-man roster from the practice squad and should serve as the Raiders' No. 3 tight end. Walford (concussion) did not participate at the Raiders practice Friday. Analysis: Walford has not practiced since sustaining the concussion against the Chiefs in Week 14. The 26-year doesn't seem likely to be available against the Eagles on Monday even with a return to practice Saturday, given his lack of practice reps over the last two weeks. Walford (concussion) has been ruled out for Sunday's game against the Cowboys, Paul Gutierrez of ESPN.com reports. Analysis: Walford suffered a concussion in Sunday's loss to the Chiefs and didn't practice this week. The 26-year-old will hope to clear the concussion protocol and make a return to action Week 16 against the Eagles. Walford (concussion) did not practice Wednesday. Analysis: Walford was diagnosed with a concussion following Week 14's game against the Chiefs. He will need to clear the league's concussion protocol before being declared active for Sunday's game against the Cowboys. 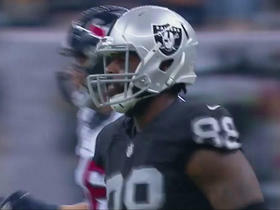 If Walford suits up, he will be listed as the third tight end on Oakland's roster. Walford was diagnosed with a concussion after Sunday's game against the Chiefs, Michael Gehlken of the Las Vegas Review-Journal reports. Analysis: Walford is listed as the No. 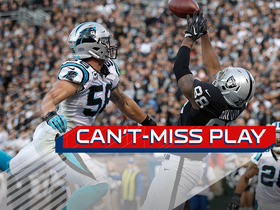 3 tight end in Oakland, but he posted four receptions and 57 yards against the Giants in Week 13. The third-year pro will have to clear the league's concussion protocol before he can get back on the game field. Walford secured all four of his targets for 57 receiving yards during Sunday's win over the Giants. 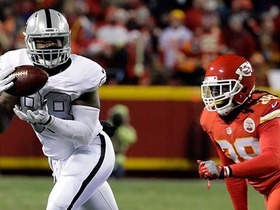 Oakland Raiders quarterback Derek Carr hits tight end Clive Walford amid three Giants defenders for 26 yards. 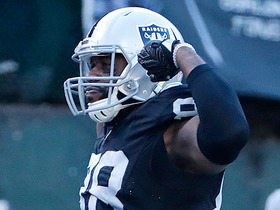 Oakland Raiders tight end Clive Walford spins for a 5-yard TD from QB Derek Carr. 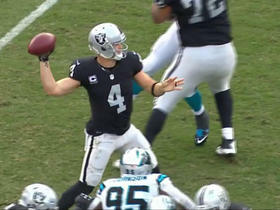 Oakland Raiders QB Derek Carr completes pass to tight end Clive Walford for 18 yards. Oakland Raiders quarterback Derek Carr threads the ball to tight end Clive Walford who makes an incredible catch for a touchdown. 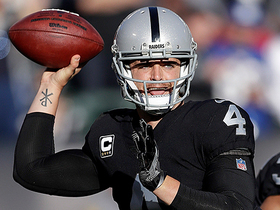 Oakland Raiders quarterback Derek Carr completes first pass after injuring finger for 17 yards. 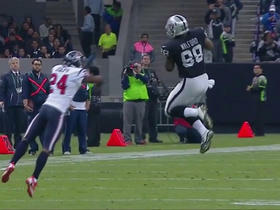 Oakland Raiders tight end Clive Walford leaps for the 12-yard reception on a pass from QB Derek Carr. 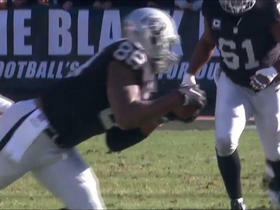 Oakland Raiders tight end Clive Walford snags a back shoulder throw from QB Derek Carr for 17 yards. Denver Broncos linebacker Brandon Marshall breaks up a pass in the end zone. 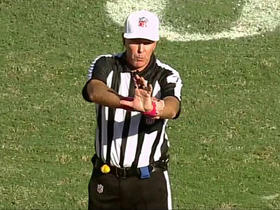 The Oakland Raiders set an NFL record with 23 penalties, the final one coming on an illegal block in the back.